If the poster looks funny, you’ll like this more than I did. Firstly what I can tell you, and what you already know if you’ve seen the preview anyway. 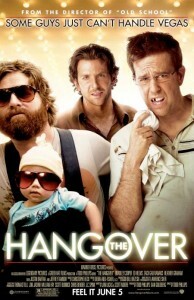 As The Hangover is basically “Blotto Memento”, and unfolds back to front I can’t give ya too much in the way of plot. 3/ This’ll take months to prove or disprove, there will be a huge “UNRATED” version that will sell many, many copies. 4/ This will become very quotable. (The jury is out, I for one can’t think of much that I would regurgitate in social situations. 5/ This one from my wife, “Bradley Cooper is Ben Affleck hot.” Now I sadly know this is supposed to be a compliment, not sure Brad Cooper would agree. The boys leave for a Buck’s party in the days prior to the wedding. Zach Galihhjgajsdfjgbjksbdjhikis (sp?) is the standard ring-in-relo that is almost always in attendance, everyone has met him multiple times but no-one really remembers him. Quick question, why a Buck’s party so close to the wedding and why could such an apparently cool guy only have two friends and a relo that would want to go? As a guy I would consider that poor form, any reasonable guy needs a couple days recovery time from a good Buck’s party. The jittery bride is told on the phone that the wedding ain’t going ahead as plan, then the wavy lines appear (in our minds) and we go into flashback mode. All of which are explained fully, aside from the chicken. Seriously, what happened to the chicken? I really hope there is a DVD extra explaining the chicken’s existence. Why? Why? Why? Was it to feed the tiger? Getting out of a night in prison. Finding a random naked guy in the car boot. Zach Galikjuhkgcvksvdckhvsjikis (sp again?) is suitably random and apparently wasted-without-being-wasted at all times. But not as randomly hilarious as is being discussed in other reviews by any stretch. Bradley “Affleck” Cooper is the most rational and realistic of the three, while he is still a wanker at times he is no more a wanker than a myriad real-life guys that I have encountered at various Buck’s parties and gents events.